New album by Prague based project Sister Body is out now as a limited edition of C30 and download on british cassette label Tesla Tapes, who previously put out also related project Lightning Glove. Isolationist approach to sound and performance which led to more dreamy and dubby EP Star / Red in 2013 (Spleencoffin) is now inspired by the toxic and poisonous aspect of electronic sound itself, although without a clear relation to the classic acid tradition. The tracks are especially based on the oppostition of nervous emotive patterns and cold voice of Miss Camilla. You can order tapes via ingnodwetrust@hotmail.co.uk, or Staalplaat distribution. 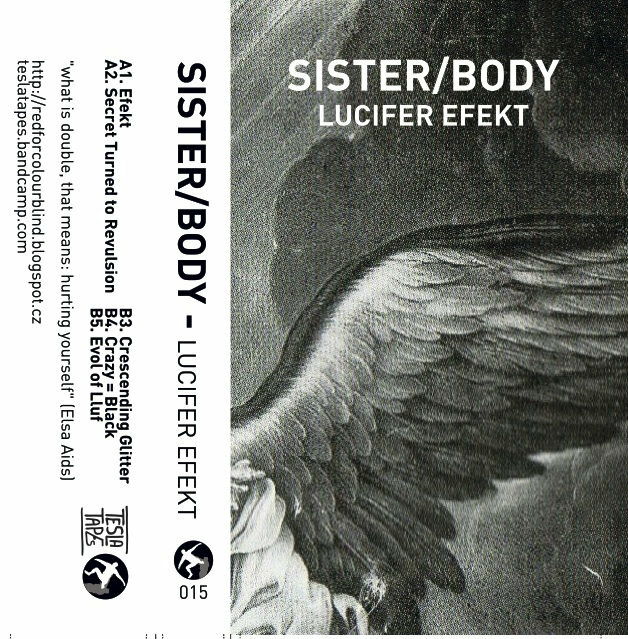 You can listen and download on http://teslatapes.bandcamp.com/album/sister-body-lucifer-efekt.